According to the State Department, President Donald Trump has authorized the release of $6.6 million in funding to the humanitarian group the Syrian Civil Defense, commonly referred to as the White Helmets. “The United States Government strongly supports the White Helmets who have saved more than 100,000 lives since the conflict began, including victims of Assad’s chemical weapons attacks,” a State Department statement read. The funding will also benefit the United Nation’s International, Impartial and Independent Mechanism (IIIM), which is responsible for investigating and prosecuting crimes against humanity, war crimes and genocide in Syria. The White Helmets, an all-volunteer group, have been lauded internationally for their life-saving actions, rushing into bombing sites to evacuate citizens and provide medical care. They have ministered to the victims of Syrian President Bashar Assad government’s chemical weapons attacks, and they often become targets of Syrian and Russian airstrikes. Their efforts were chronicled in a critically-acclaimed Netflix documentary. Syrian Civil Defense White Helmets, rescue workers work the site of airstrikes in the al-Sakhour neighborhood of the rebel-held part of eastern Aleppo, Syria. 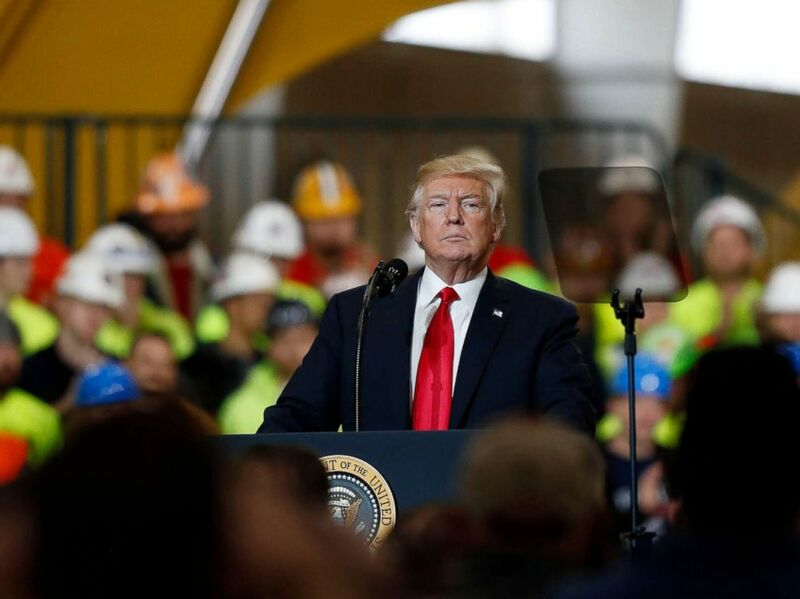 President Donald Trump speaks about his infrastructure plan during a visit to Local 18 Richfield Training Facility in Richfield, Ohio, on March 29, 2018. There are currently approximately 2000 U.S. servicemembers in Syria, and there are dozens of USAID and State Department officials and contractors working on de-mining, rubble removal, and restoring water, electricity, schools, and hospitals. A State Department statement at the time funding was frozen said the Department continually re-evaluates appropriate assistance levels and how they are best utilized. One State Department official defended the decision to freeze funding, telling ABC News "The US jointly supports the White Helmets with other donors, and we expect their operations to continue as a result of additional multilateral donors. The President has been clear that partners and allies should assume a larger role in stabilizing Syria." The White Helmets had received about $33 million from the U.S. at the time the funding was frozen. There are about 3000 volunteers in the group. The group has been lauded for their life-saving actions, rushing into bombing sites to save civilians and often being targeted themselves. On Thursday, the State Department said of the group: "The United States Government strongly supports the White Helmets who have saved more than 100,000 lives since the conflict began, including victims of Assad’s chemical weapons attacks. 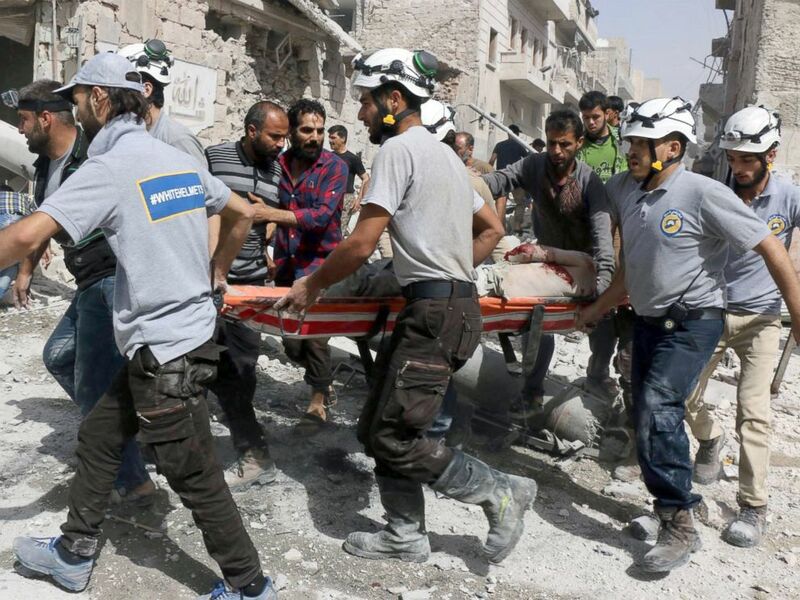 These heroic first responders have one of the most dangerous jobs in the world and continue to be deliberately targeted by the Syrian regime and Russian airstrikes.? Since 2013, more than 230 of these brave volunteers have been killed while working to save innocent Syrian civilians."